This got a few comments, TV3 changed theirs, a hashtag was born, and before long, it became a *thing*. So – what did we learn? It wouldn’t have been possibile without CateOwen, Mediawork’s savvy Social Media Strategist, who picked up on our challenge, and gave it a hashtag. Classy move. This was a simple way to have some fun with a low barrier to entry (I WAS pretty amazed at the amount of people who had ready access to digital baby photos!). Everyone loves nostalgia, and tweeters seeing each other in bad knitwear and haircuts was a real hoot. Friday factor helped too, I reckon, everyone’s in a relaxed, optimistic mood on Friday, aren’t they? Could you do this again? Probably. Would it work every time? I doubt it, and I think it’s easy to outstay your welcome on these, you run the risk of being seen to try too hard. The simplest ideas are the best ones, aren’t they? Was it good for Telecom, and the other corporates involved? I think so. Spot, the face of our marketing in the early 90s got a lot of compliments – while brands are important and big business, it’s all about what people *feel* about you at the end of the day. Hopefully this shows we’re human, confident and don’t take ourselves *too* seriously. Is this big, for this kind of thing? I don’t know. Was it fun? Yes – the most important part of Social Media is the social, innit? 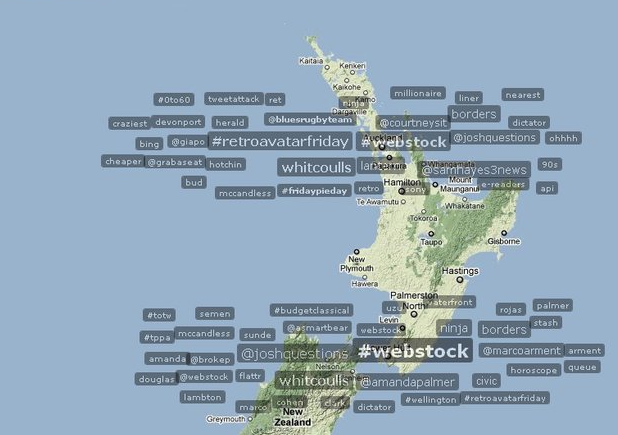 Selfishly, I’d like to have tried this on a day that Webstock wasn’t on – with Wellington’s digerati involved instead of sitting in a conference pecking away at their phones, it could have gained even more momentum. So thanks for everything Spot – there’s life in the old dog yet. That was a great idea, Rich. Well done Cate Owen, too. I was glad to see ASB joined in, too.